The United States Mint on Thursday announced the designs and released associated images for the 2012 Presidential Dollar Coins. 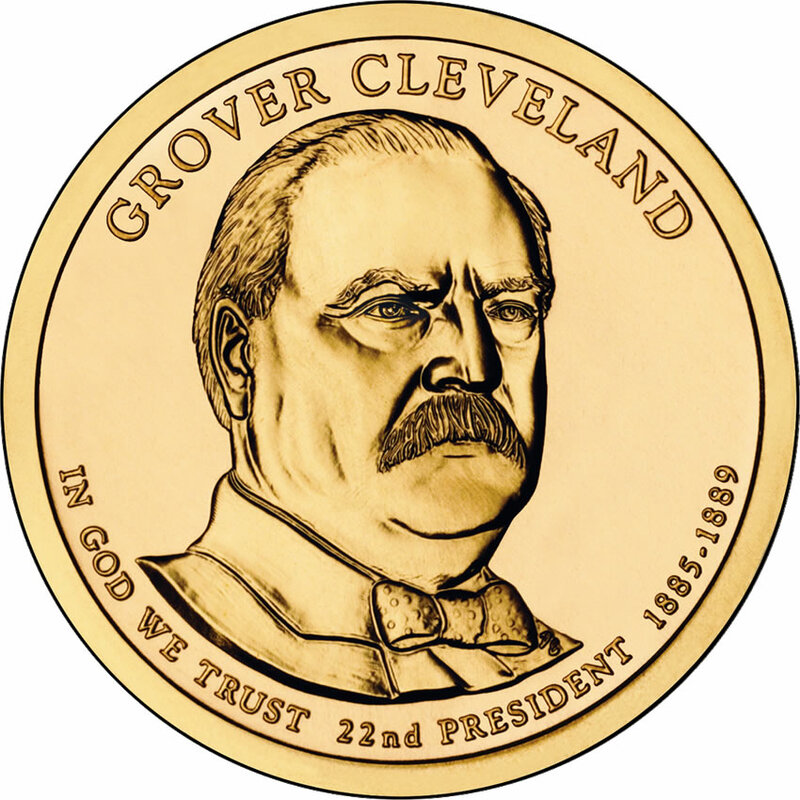 Showcased on the four 2012 coins are obverse portraits of former Presidents of the United States Chester Arthur, Grover Cleveland (acknowledging his first term), Benjamin Harrison and Grover Cleveland again (acknowledging his second term). These four issues mark the twenty-first through twenty-fourth of the Presidential $1 Coin series. The program debuted in 2007 under which new dollars are issued annually in the order in which the individuals served in office. Accordingly, the inaugural strike in the series was the George Washington Presidential $1 Coin honoring the first President of the United States. While 2012 is the sixth year for the coins, it also constitutes a significant departure from the past. In the first five years of the series, the dollars were struck for circulation. As such, they were available for purchase at face value from local banks who participated in a Federal Reserve Bank program allowing them to order quantities for distribution. However, last month the Secretary of the Treasury directed that future dollars honoring Presidents no longer be produced for circulation as stockpiles of the previous releases were going unused in Federal Reserve vaults. Going forward, the series dedicated to the former chief executives of the country will only be struck by the United States Mint for numismatic purposes, similar to the Kennedy Half Dollar also issued by the Mint. Each dollar in the series, including the four new 2012 releases, features an image of the Statue of Liberty on their reverse. This image was designed by Don Everhart and also includes the inscriptions of "$1" and "UNITED STATES OF AMERICA." An edge inscription is also found on each coin. This inscription indicates the year of mintage as well as a mintmark, thirteen stars and "E PLURIBUS UNUM." 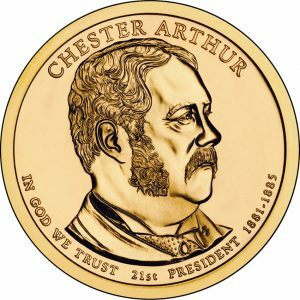 Showcased on the obverse of the Chester Arthur Presidential $1 Coin is a right-facing portrait of the twenty-first President of the United States as designed and engraved by Don Everhart. Obverse inscriptions on the strike include "CHESTER ARTHUR," "IN GOD WE TRUST," "21st PRESIDENT" and "1881-1885." 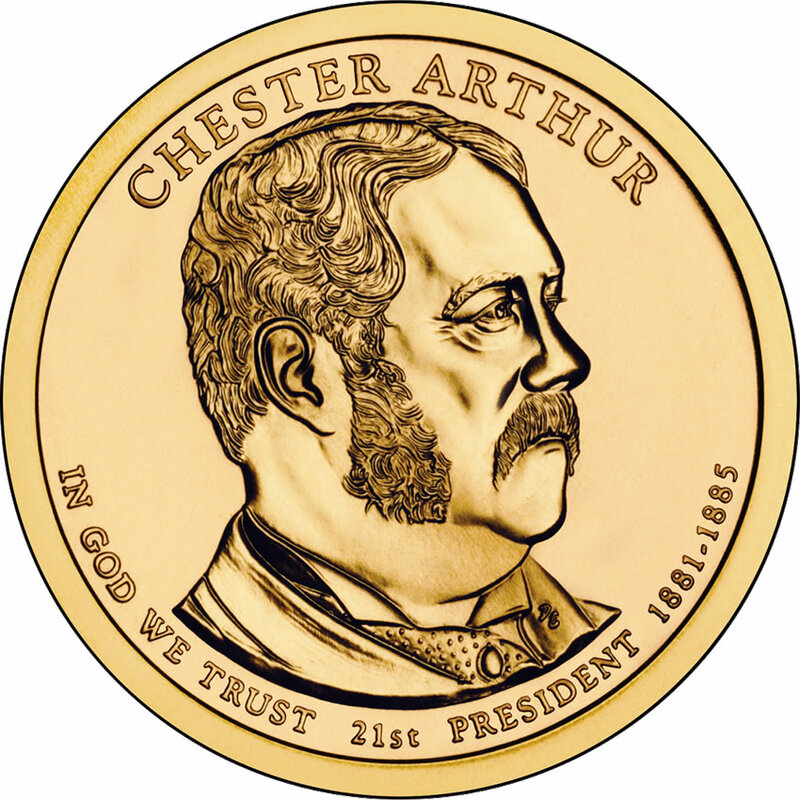 The release date for the Chester Arthur dollar is expected to be on February 16, 2012. 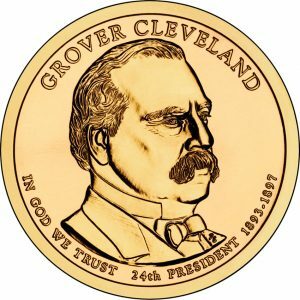 Acknowledging his first term as President, the first term Grover Cleveland Presidential $1 Coin shows a slightly right-facing portrait of Cleveland. This effigy of the twenty-second President was completed and engraved by Don Everhart. Obverse inscriptions for the design include "GROVER CLEVELAND," "IN GOD WE TRUST," "22nd PRESIDENT" and "1885-1889." 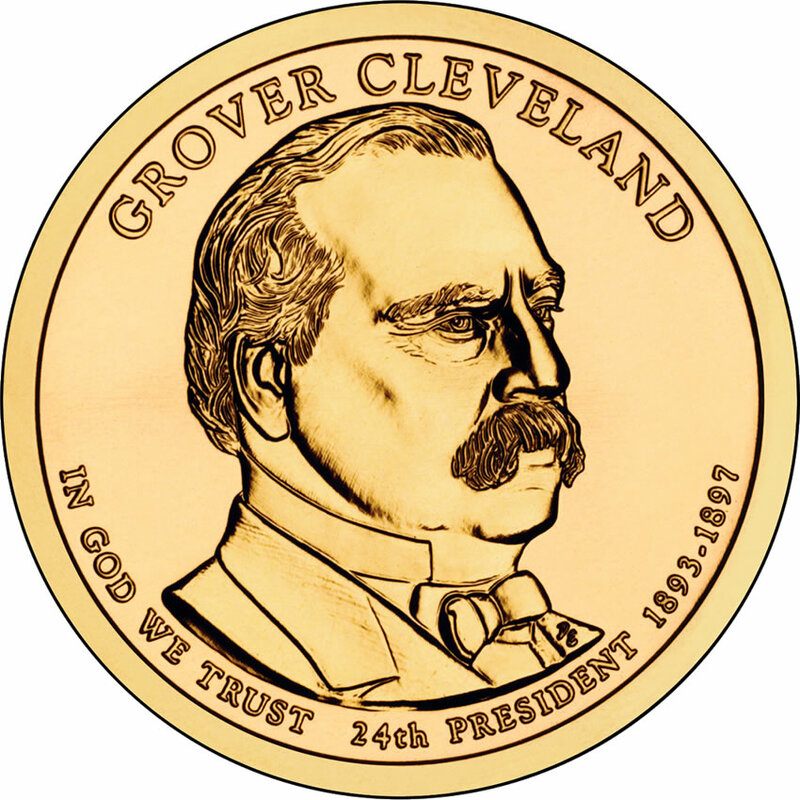 The release date for the first Grover Cleveland dollar is expected to be on May 17, 2012. The twenty-third President of the United States is honored on the Benjamin Harrison Presidential $1 Coin with a left-facing portrait of Harrison. This image of Harrison was designed by Phebe Hemphill who was also responsible for the engraving duties of the coin. Surrounding the portrait are the inscriptions of "BENJAMIN HARRISON", "IN GOD WE TRUST", "23rd PRESIDENT" and "1889-1893." 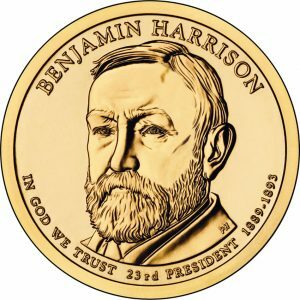 The release date for the Benjamin Harrison dollar is expected to be on August 16, 2012. The last strike of 2012 to appear as part of the program will be the second term Grover Cleveland Presidential dollar. This release acknowledges his second non-consecutive term as the President of the United States with a more severe right-facing portrait as designed and engraved by Don Everhart. The $1 coin also includes the inscriptions of "GROVER CLEVELAND", "IN GOD WE TRUST", "24th PRESIDENT" and "1893-1897" on the obverse. The release date for second Grover Cleveland dollar is expected to be on November 15, 2012. A complete listing of the individuals to be honored in the series and the order is available via the United States Mint release schedule. Hey US MINT…STOP THE PRESSES…!! You made a mistake with the images w/ regard to his age & term dates. 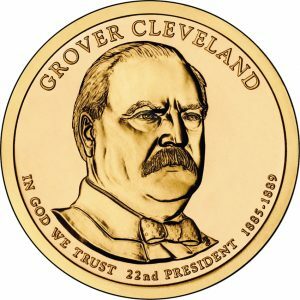 Cleveland looks older on the 1st term coin, and younger in the 2nd term coin. Actual photos of the time will demonstrate this. Sheesh, can’t the gov’t get anything right? Good catch George, what caught my eye was the difference in the hairline. Also, Cleveland was a very sick man at one point in his 2nd term. He had some kind of a cancerous growth removed from his jawbone and was not nearly as active or productive as the first time around. Stock piles of unused coins are taking up space in federal reserve vaults because no one in the government is pushing them. I don’t think paper dollars should be eliminated, but in my own humble opinion one dollar coins as well as half dollar coins should be pushed.